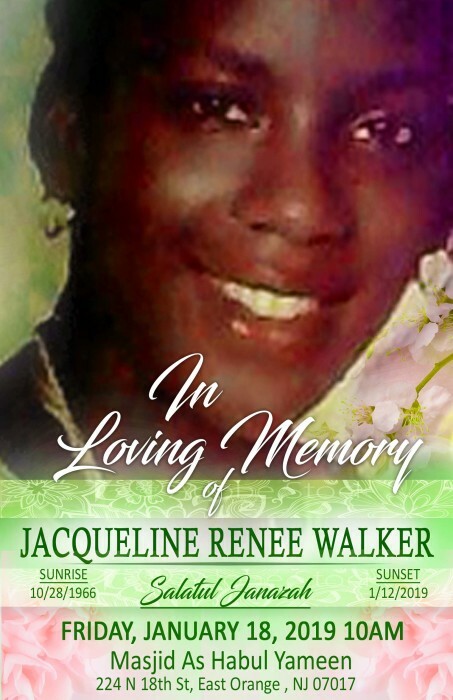 Jacqueline Renee Walker, 52 years of age, passed away peacefully in her sleep on the 12th of January 2019 at her home in East Orange, NJ. Jacqueline was born October 28th, 1966, the daughter of Elliott Walker and Mae Francis Barber Walker in Newark, New Jersey and was the only girl amongst her 4 siblings. She grew up in Irvington, a graduate of Irvington High School, and followed with a study of Computer Science at the New Jersey City University before moving with her family to East Orange. She is the mother of 5 children, all boys, as well as a 2nd mother to all her nieces and nephews. Also a grandmother of one.